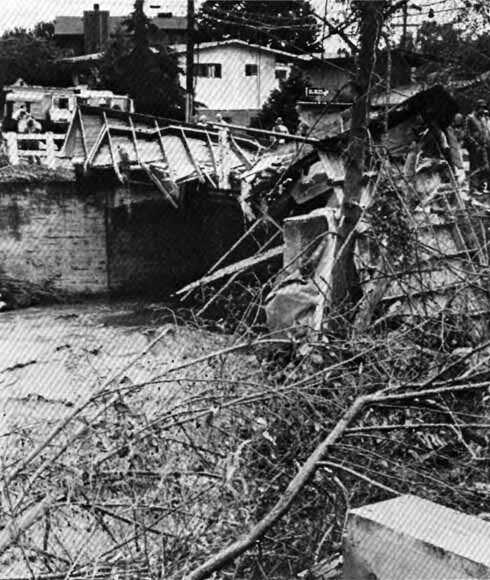 A catastrophic rainstorm in central California on January 3-5,1982, dropped as much as half the mean annual precipitation within a period of about 32 hours, triggering landslides and floods throughout 10 counties in the vicinity of the San Francisco Bay. More than 18,000 of the slides induced by the storm transformed into debris flows that swept down hillslopes or drainages with little warning. Debris flows damaged at least 100 homes, killed 14 residents, and carried a 15th victim into a creek. Shortly after rainfall ceased, more than 459,000 m3 of earth and rock slid from a mountainside above the community of Love Creek in Santa Cruz County, burying 10 people in their homes. Throughout the bay region, thousands of people vacated homes in hazardous areas, entire communities were isolated as roads were blocked, public water systems were destroyed, and power and telephone services were disrupted. Altogether, the storm damaged 6,300 homes, 1,500 businesses, and tens of kilometers of roads, bridges, and communication lines. Preliminary rough estimates of total storm damage, compiled for emergency purposes within 2 weeks of the storm, exceeded $280 million. Carefully documented direct costs from landslides exceeded $66 million; total costs from landslides certainly were greater and probably constituted a much larger proportion of the total storm damage than suggested by these disparate figures. Landslides accounted for 25 of the 33 deaths attributed to the storm. Download the text as a 319-page PDF document (pp1434.pdf; 123 MB).